Silicone is a very versatile product to work with, offering excellent resistance from a wide range of chemicals and extremes of temperature. Its rubbery nature makes it liquid resistant, and it has good pressure handling capabilities. 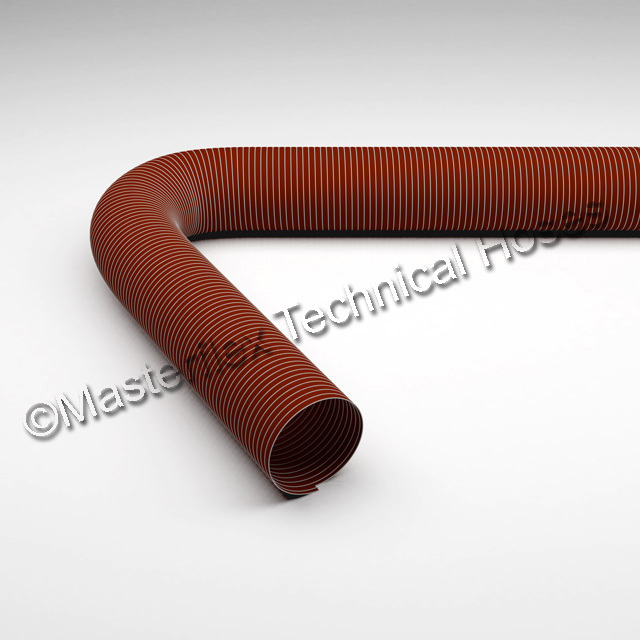 Hose manufacturers often use materials coated in silicone to create materials with multiple complementary characteristics, with silicone coated glass fibre fabric material being integral to most high temperature hoses and ducting. Sprung steel wire internal support, allows the hose to be very flexible, whilst the sprung steel helps prevent the hose from sagging. Used across a range of applications, from air / brake ducts in car engines, railway carriage HVAC systems, steam vents on industrial washing machines, chemical solvent and toxic fume venting, anywhere where temperature, both hot or cold, can be an issue, where dust and toxic fumes need to be handled. External galvanised steel wire external support helps protects the hose from scuff damage, for example dragging on the floor, or against a wall. The external helix and soft fabric hose material makes this hose extremely flexible, allowing it to collapse lengthwise by up to 3 to 4 times.